I grew up 12 miles from the start of the Boston Marathon. In grade school, I went on countless field trips to the New England Aquarium, the Museum of Science or walked the Freedom Trail, almost always ending our jaunts at Quincy Market and Faneuil Hall. My friends and I would hop on the T while we were in high school and hang out at the JFK Library. When I left Massachusetts to go to college, I would come back and visit my best friend in Boston, who then lived on Boylston Street. When I moved to Denver, co-workers called me “Boston” because, well, my demeanor was a bit rough around the edges compared to others out west. The marathon is a big part of my childhood memories. The entire state takes the day off to cheer on the runners. On Monday, I felt sadness and disbelief. On Tuesday, I felt violated and angry. By Friday, I wanted to go out on the streets and find that last suspect myself. Those men messed with the wrong city and the wrong event. 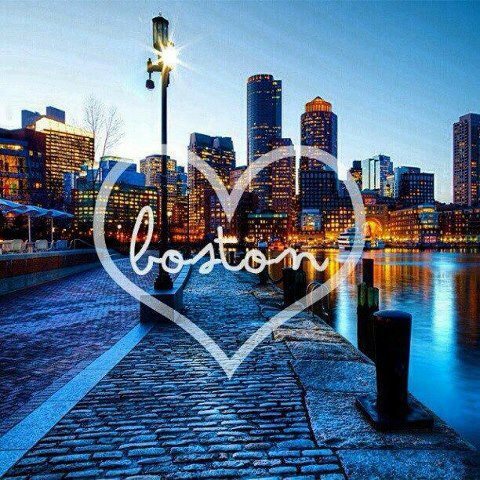 There is something magical and sacred about the Boston Marathon. If you didn’t know it before, you know it now. The fact that the entire city of Boston shut down to look for the suspects is not surprising to me. There is no way that community would sit back and hope for a resolution. They went out and hunted those men down. And let’s not forget the runners. Ever hear of Heartbreak Hill? It’s between the 20th and 21st mile of the Boston Marathon. What seems like cruel and unusual punishment to me is just another challenge to a marathon runner. I’ve sat and watched runners at that point in the marathon and willed them up that hill. It’s painful as a spectator. Some of those runners on Monday – who were stopped abruptly and probably in need of their own medical attention – ran another 2 miles to the hospital to donate blood. When they found out what happened, they helped. And so did many others in Boston that day. We were supposed to take a family trip down to Boston on Wednesday to celebrate the end of tax season. After talking with the boys about what happened, we decided not to go. Me (to my boys): The brave police caught the other bad guy last night. G: Yay! Did they take him to jail? Me: Well, he was hurt, so they first had to take him to the hospital. G: Did they help him? Me: Yes. Because hospital workers help everyone, even bad guys. G: And then they’ll take him to jail? Me: Yes. Then they’ll take him to jail to make sure he doesn’t hurt anyone else. Biz: And then they’ll teach the bad guys to be good again. As the dust settles from this latest tragedy, it is time, once again, to heal. It is time to remember Martin Richard, Krystle Campbell, Lu Lingzi and Sean A. Collier. It is time to support those who are recovering from their wounds. It is time to say thank you to all the helpers, from the spectators to the first responders. 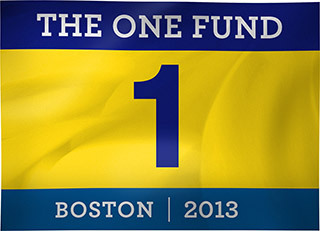 This month, as part of my Giving Pledge, I’m donating to One Fund Boston. The money from this fund will go to the families who were most affected by the Boston Marathon bombings. How about drinking a litte dirty water and joining me? 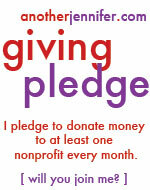 Are you willing to take the giving pledge and donate every month to a nonprofit? Grab the badge below and tell the world. My heart hurt while reading about your childhood in Boston because while those bombings felt personal to me and to many of us, they must have felt personal to you on an entirely different level. I know what it’s like to love a place and love the memories I have associated with that place and then to see something terribly bad happen there. Thank you for publicizing your giving pledge to the 1 fund and I hope it inspires many others to give as well. Thank, Ilene. It felt too close this past week. I’m sick of explaining these terrible events to my sons. Much like Hurricane Sandy or Sandy Hook, there are some wonderful stories of people helping and persevering. I think these stories help us heal a bit. My grandparents met and married in Lynn Mass. not far from Boston. My Nana’s first steps on US soil was in that great city. I thing what you’re doing by promoting giving for those who need it there is such a good thing Jennifer. Thanks, Jen. I’m thankful that none of my friends or family members were hurt and that they got the second suspect alive. Thank you, Chris. I truly loved your post today! I don’t do all that much blogging on the weekends (despite my two weekend posts since like…July of last year, haha) but I wanted to comment and just say that this post is so sweet and I didn’t know about your close connections with this. I hope you experience your own healing. HUGS! Thanks, Cyndi. I try to give myself the weekend off from blogging, but I felt compelled to write this past weekend. There’s so much more that I wrote, but I cut it down. I had to get some of my thoughts out. It felt good. We’re looking forward to taking a trip down to Boston very soon! I wish it were only that easy to teach people to be good again too! This is a great cause and i’m glad to see they are doing it. The poor people who lost limbs… it’s just so sad. I know, right? It’s hard to explain to kids why people do such bad things. There are some amazing stories coming out of Boston. I’m not sure how much everyone sees. My FB feed is full of people from the area, so it’s full of those stories. I hope the fund will help those who need it. I think they are up to $80k right now.